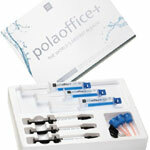 Pola Office's total treatment time is about 30 minutes. Less chair time means increased patient comfort, satisfaction, improved productivity and profitability. Pola office contains potassium nitrate, a konwn desensitising agent. It acts on the nerve endings by blocking transmission of sensitive nerve impulses and providing a calming effect.